A heavenly head massage/anointment followed by the continuous stream of oil flow over the forehead in a Specific rhythmic Swaying Movement. 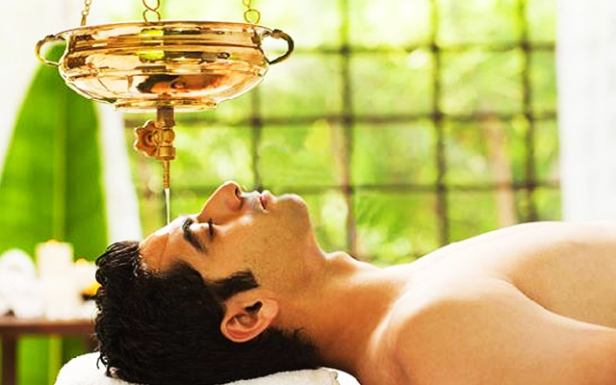 Shirodhara helps mainly rejuvenating and relaxing the central nervous system. “Shiro” meaning head and “dhara” meaning flow, bringing together the concept that aims at bringing physical and emotional balance. Shirodhara is good for all ailments especially for those associated with organs above the neck. It is highly recommended for correcting mental condition especially for stress and obsessive behaviour. It uses herbal oils, medicated milk and butter milk, pure ghee etc., for 7-14 sessions or more depending on the requirement and the assessment of the physician.